Born in Acapulco, Guerrero but raised in Guadalajara, Jalisco. He trained with Diablo Velazco for 3 years and El Forastero for 2 more years. His debut was in Arena Polanco on April, 1985, same date as his brother Mercurio. Wrestled at Arena Coliseo Guadalajara, El Toreo with LLI. During 1990s he presented in AAA in events in California. 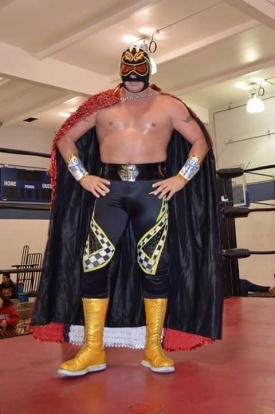 He participated in the event AAA/WWO/UWA Triple Power on October 27, 1994 in Tijuana, Baja California. Wrestled at Pista Arena Revolución, Arena Naucalpan, Arena Neza and all arenas from Querétaro. In the United States he had been in many independent promotions including the AWS, CZW, WCW, and FMLL. He had a puroresu career, he wrestled in Michinoku Pro Wrestling for ten years. He disputed competed against Super Delfin for the Universal/FULL UWF Super Welterweight Championship in Yamagata, Japan. Wrestled in FMW/WWA event in FMW in Los Ángeles. Moreover, he had tours un Canada and England. He is part of the group The LA F**kers. This page was last edited on 20 April 2019, at 09:53.